love Aaron's tone and narrative, these fascinating little bites are sometimes all I need for a quick drive or to finish a tedious task. From the creator of the hit podcast Lore comes a new, bite-sized storytelling experience. Each twice-weekly episode features two short tales that take listeners on a guided tour of the unbelievable, the unsettling, and the bizarre. Life rarely goes the way we plan it. Some people aim for fame and miss the target, while others attract it without trying. In either case, what happens next is worth re-telling. Most stories have something big and powerful at their core that gives them meaning, but it's often the little details that make them memorable. Both of today's tales fit that bill nicely. Some human accomplishments are frightening, and others are hilarious. I hope you don't mind if the tour guide shows you one of each today as you pass through the Cabinet. Today we explore the lives of two amazing individuals. One was known for what he could see in reverse, while the other managed to see what was ahead. Both are fantastic additions to the Cabinet. Whether it's a ridiculous disagreement, or an unbelievable source of information and warning, there are amazing events to ponder on today's tour through the Cabinet. Some people are extraordinary during their lifetime, while others manage to leave a mark long after they're gone. Today's tour through the Cabinet will introduce you to one of each. How things are built can inspire wonder and awe, as this trip through the halls of the Cabinet will surely reveal. Some folks create things that are difficult to believe. Today's tour features two such tales. Just remember: seeing isn't always necessary for believing. Some of the most bizarre additions to the Cabinet are relics from a taboo source: the human body. Thankfully, their stories are a lot less contentious. Many of the pieces in the Cabinet are unique, but some are truly valuable. On today's tour, we'll revisit lost loved ones before exploring one man's deep obsession. Our tour today will reveal an object designed to show us where to go, and a place no one knew how to get to. Hopefully all your questions will be answered inside the Cabinet! Humans have created some amazing things over the years, but few have left people feeling as confused and nervous as the two objects you'll see on today's trip through the Cabinet of Curiosities. Death can be pretty eventful—either by the way it happens, or by what happens once it has arrived. We'll look at one of each on today's tour of the Cabinet. Many of the objects inside the Cabinet are one of a kind, or at least very rare. Today's tour will expose you to two more stories that will fit that mould perfectly. Sometimes it's hard to believe the things we see with our own eyes, while other times we have to trust our ears to reveal the truth. Both of these tricky moments are on display in the Cabinet today. Two amazing individuals are on display in the Cabinet today, and both are know for amazing claims that had unexpected endings. Buckle up for a curious ride. Today's tour through the Cabinet is all about hidden things, so there won't be much to look at. Even still, the tour is sure to be entertaining. Accidental discoveries are on display today in the Cabinet of Curiosities. Your journey is bound to leave you astounded. Unique individuals can be both an inspiration and a warning. Let's see if you can figure out which is which on today's tour through the Cabinet. Whether it's a battle for historical heritage, or a fight against Mother Nature, everyone on today's tour has had to endure some kind of struggle. Sometimes the place you live is home to astounding natural features, while other times your country is responsible for something new. Let's learn about both, shall we? On today's tour of the Cabinet, one person delivers on their promise, while another stays right where they are. Either way, these tales are sure to entertain. Today your tour guide will show you some amazing tales made possible by the brilliant work of talented people. Prepare to be amazed! Not every story has a tidy ending. Often times, it's the journey that's more important than the destination, as both of our tales reveal today. Some of the most amazing tales in history are about artwork, and today's tour of the Cabinet will reveal a couple that you'll never forget. Some tales from the Cabinet reveal the true importance of people, while others hint at a true story we may never be able to reveal. Today we'll enjoy one of each. One of a kind objects are on display today, but not all of them were acquired through the most typical of methods. In fact, one of them wasn't even acquired at all. Some Curiosities are delightful and happy, but not on this tour. Today, we meet human cruelty and suffering head-on, but walk away richer for it. This tour of the Cabinet will expose visitors to things so small they're barely visible, and sounds so deadly they shouldn't be heard. Some people break through barriers with the power of their will, while others rise above in the more literal sense. Either way, they make great additions to the Cabinet of Curiosities. As you pass through the Cabinet today, keep your eyes on that spot where the sky meets the ocean. Amazing things can come from both. Connections are often an invisible thing, but they bind us together in unique ways. Today's journey through the Cabinet will reveal a few of the more surprising ones. Today's tour through the Cabinet is a family matter, which everyone knows can be a complicated thing. But regardless of what life throws at us, blood will always be blood—with uncanny devotion. On today's tour through the Cabinet, you'll meet an object that didn't want to be caught, and an individual who desperately needed to be. Some people are bound together across time, while others are bound by blood. In both cases, the ties that bind have a way of keeping us in rhythm. Whether that's good or bad, we'll leave up to you. We talk a lot about unique individuals, but sometimes it's good to mention some amazing pairs. Here are a few for the Cabinet that we think you'll enjoy. Sometimes similarities run in the family, and other times a close group of people end up thinking alike. Either way, they make great tales for the Cabinet. The world is full of astounding people who always find a way to leave their mark. If you keep a watchful eye during today's tour of the Cabinet, you just might spot them early. Family is a curious thing. Given enough time, some amazing things can happen. Those are the sort of tales on display in the Cabinet today. What tour of the Cabinet would be complete without an introduction to a pair of writers who seem to have slipped under the radar—if only in name, that is. The Cabinet today plays host to those who go to extremes to make a point. Whether it involves running away, or jumping into the fray, there's something to be said for conviction. Today's tour of the Cabinet will introduce you to two people who weren't about to back down from a commitment, no matter how high the odds were stacked against them. It's absolutely amazing what someone is capable when they put their mind to it. Today's tour provides us with examples of just how good—and bad—that can be. Two items are on display in the Cabinet today. The first is something none of us would want, while the second is a dream come true. We hope you enjoy discovering which one is which. What tour of the Cabinet would be complete without an introduction to two amazing individuals? Today's guests are guaranteed to enthrall and entertain you. Sometimes people accidentally harm others, and sometimes it's intentional. Either way, there's no way to explain what happens to the subjects of today's tour through the Cabinet. Science is on full display in the Cabinet of Curiosities today. Whether its the creation of something new, or the reevaluation of something old, it's amazing what can come out of the laboratory. First, two women compete for the same reality. Then, two other women explore the nature of time itself. Both stories will leave you glad you toured the Cabinet today. Creations are on display today! Sometimes it takes a village, and other times it's just a matter of available materials. Either way, the results are amazing. Two gifted men, each with a similar legacy. Neither had an equal, and both possessed gifts now lost to time. Each of today's stories reveals just how difficult it is to outrun the past; some will be overcome, while others will rise above it all. Some people strive hard to get away, while others want nothing more than to retreat deeper inside. either way, they've left us with amazing stories. Human ingenuity might bring us wonder and joy, or it might bring us tragedy and sorrow. The only way to find out which story does what is to listen to both of them carefully. Today we present two stories of individuals who show us just how powerful the human spirit can be. On display today is the portrait of one lucky lady and the details of a battle that is famous for very little. Today's tour might sweep you off your feet, or leave you feeling defeated. Either way, you're in for an explosive ride. Pay attention during your tour of the Cabinet today, because things aren't always what they appear to be. Each of today's stories offers us a chance to answer the same question: how much of yourself would you be willing to give up in exchange for an extraordinary life? One of our subjects had no choice, while the other rushed in head-first. On our tour of the Cabinet of Curiosities today, we will meet two unique individuals. One spent his life looking for fame, while the other wanted to escape it. Whether they each achieved their goals is up for debate. Seeing is believing. At least, that's what people say. But the objects on display in the Cabinet today stretch that cliché to the limit. Sometimes our tour through the Cabinet introduces us to tales of loss and letting go. Other times, we encounter events that are are simply too amazing to be true. This is one of those tours. Today's tour through the Cabinet of Curiosities is a little hot, a little cold, and a whole lot of mysterious. Whether everything in life is spelled out for us, or left entirely to chance, there's never a dull moment inside the Cabinet of Curiosities. Today's tour introduces us to a fateful voyage and a plumbing problem with a haunting solution. Neither one are easy to believe, though. On today's tour of the Cabinet, one group of people has a foggy experience, while then another has sees stars for the first time. Sometimes people try hard to fool those around them, while others find themselves being fooled by someone else. Either way, the stories they create are wonderfully entertaining, and delightfully unusual—perfect additions to the Cabinet. A stroll through the Cabinet of Curiosities today will reveal some unbelievable artwork and a lost tale from our nation's early years, both of which are entirely unexpected. Today's tour introduces us to an irreverent hero and a brave chef, both of who have a lot to teach us about thinking outside the box. Some people welcome limitations as a way of testing their prowess and endurance. Others have those constraints forced upon them. This tour through the Cabinet will give us a glimpse of both kinds of people. Some people just aren't who they appear to be. Some of them hide their past deep beneath a layer of deception, while others wear their duplicity in plain sight. Either way, they make for great additions to the Cabinet of Curiosities. On display in the Cabinet today are a pair of topics with one thing in common: both had humble beginnings, but went on to leave clear, memorable marks on the pages of history. Sometimes the consequences of our actions can lead to a dark destination, while other times it frees us up to transform into something bigger and better. Today's tour of the Cabinet will reveal one of each. Today's tour explores the mysterious beginnings of a criminal mastermind, and then shifts gears to a spy thriller with an ending that will strike you as more than a little eerie. Today we learn the history of a famous battle, and just how much it has impacted out modern diet. Then, we pay a visit to a former sailor who experienced something that changed his life forever--and left a permanent mark on our own. Some wonders lay hidden beneath the earth, while others are taken on a grand tour of Europe and America. Join us today for two new curiosities to explore. On today's tour of the Cabinet of Curiosities, we take a long look at two men who shared a lot more than a job title, and then we try to wrap our minds around a series of events that simply can't be true. Today in the Cabinet, we'll examine the life of two different individuals who both managed to escape the laws of probability, and their stories are all the more entertaining because of it. Unique and fascinating individuals are on display in the Cabinet today. One man's example sets the stage for more than a century of entertainment, while another man comes face to face with his own shadow. Today's tour of the Cabinet reveals the story of one man who can't seem to escape his destiny, while another tale is full of nothing but escapes. The Cabinet holds tales of wonder and impossibility today. Meet a man with a very peculiar vision of the future, and then take a house call from a renowned physician. Neither tale will end the way you expect. Today's tour of the Cabinet takes us into the world of dreams. In our first tale, a pair of men find everything they were looking for. In the second, two men encounter something altogether impossible and unexpected. 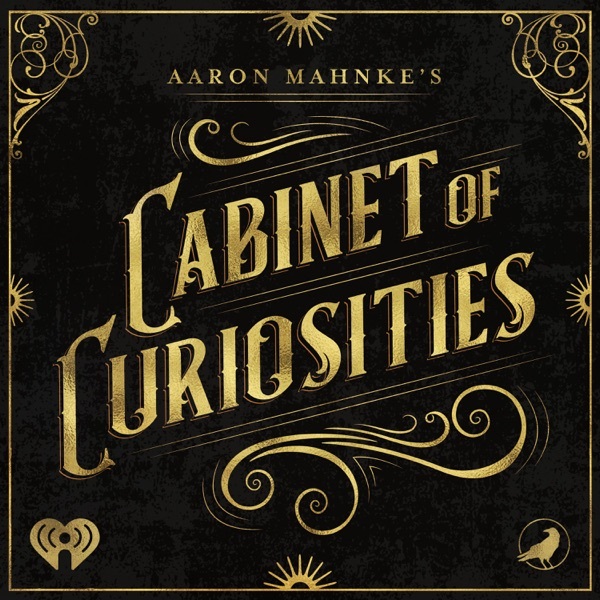 For today's tour of the Cabinet, listeners will hear the shocking story of one man's exploration of the past, while another person manages to leave a legacy that has hung around ever since. Are you curious about the sky? Today's tour involves a series of unusual sightings, as well as the very model of aerodynamic perfection.